The armament underwent some moderate changes. The venerable GU-11 gun pod was replaced with a more advanced GA-10 gauss rifle. This weapon had a range of 3 km and could fire 40 mm nickel slugs once per second. The GA-10 had a internal ammunition supply of 60 rounds. The older nose blister head lasers were removed and instead the head lasers were upgraded to the MoV-20 series of laser cannons. Designers felt that the power plant could not provided adequate generation capacity for both nose and head lasers, and as such chose the head lasers because of their capacity to fire in all modes. Initial testing began on November 15 2013 at RDF New Albuquerque base. 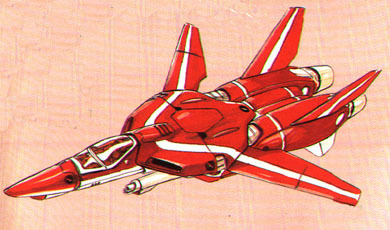 The XVF-1K proved itself an excellent fighter easily surpassing all of the combat statistics for the older VF series of veritechs. Only a single problem arose with the fighter. The induction coils in the GA-10 series gauss rifle could misfire and destroy the weapon. However, weapon designers felt that given enough time this problem could be fixed. 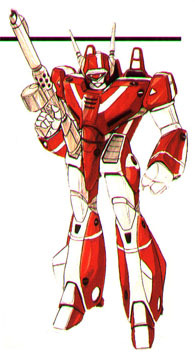 Unfortunately for the XVF-1K team, the XVF-4 series of veritechs proved to be the superior fighter in all respects. The RDF high command came to the decision in January of 2014 that the VF-4 Lightning would become the next main transforming fighter and ordered all subsequent designs canceled and the fighters mothballed. The remaining 15 XVF-K series of fighters were placed in storage outside of Monument city. This could have been the end of the XVF-1K; however in January of 2030 during the beginning stages of the 2nd Robotech War, the remaining XVF-1K series of veritech fighters were brought back out and reformed into the 271th squadron "Black Hats" flying out of Folker Field. The squadron was able to refurbish 10 of the remaining 15 fighters with more advanced electronics and armor, such that the fighters were now roughly equivalent to the VF-1M "Morningstar" upgrade. The GA-10 gauss rifle was discarded in favor of the more reliable GU-111 series of gun pods. The squadron distinguished itself shooting down three assault crafts during the final stages of the Second Robotech War. Unfortunately, the 271th was completely destroyed when a Robotech Master assault shuttle completely obliterated Folker Field with its Electro-beam cannon during the final battle of the 2nd Robotech War. No examples of the XVF-1K were known to survive. Destroying the sensor head of the 1K will knock out the mecha's major sensor systems, including all of the optics systems (infrared, nightvision, thermal). Radar and communications will be unaffected. Two Nakajima/P&W/Rolls-Royce FF-2002 fusion turbines, total engine output 275kN total at max. power; 550 kN are available with overboost. Exhaust nozzles allow for vector thrust, serving in place of conventional elevators. System includes two reverse-vernier thrusters, on blisters outboard of each intake; exhaust comes directly from main turbine at a maximum of 20% thrust. GA-10 50 MM GAUSS RIFLE: firing 60 rounds per minute with 60 rounds stored internally. The RDF briefly considered replacing the GU series of gun pods with gauss rifles. However, early experiments showed that these weapons were completely unsuited to battlefield operations as the induction coils tended to explode, destroying the weapon in the process. 2 x MAUSER R�V-20 HEAD LASER CANNONS HEAD: The head lasers were upgraded to the RoV-20 laser cannons. These cannons are identical to those mounted in the nose blisters. DAMAGE: 3d6 for each single shot or 6d6 for each dual shot. BODY/WING HARD POINTS: Two fixed hard points are mounted on each wing. These hard points can be used to carry 15 short range missiles, 5 medium range missiles or 2 long range missiles. HAND TO HAND COMBAT: If necessary, the 1K can engage in melee combat rather than use a weapon. The VF-1K is extremely agile and can execute most typical hand to hand combat moves, such as punches, jump kicks, leap attacks, rolling with impacts, etc. AUTO-PILOT: The 1K is equipped with a computerized auto-pilot, allowing the pilot to relax or even sleep during long voyages. The auto- pilot can be programmed with a single destination or a complex flight plan involving multiple speeds, directions, and destinations. The onboard computer will alert the pilot when the fighter is near its destination, and can also be set to automatically signal when sensors detect objects near the mecha. 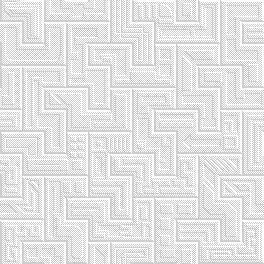 The auto-pilot was designed with long intra-system space journeys in mind. HOMING SIGNAL: The escape pod of the XVF-1K is equipped with a homing device that enables rescue teams to locate a disabled craft or ejected life pod. The range of the signal is 400 miles (640 km). Most REF ships and veritecs can locate and track a homing signal, and the onboard computers will automatically notify their pilots if such a signal is detected. SELF-DESTRUCT: To prevent capture of an advance variable fighter by the enemy, the pilot can activate the XVF-1K self-destruct system, which will cause the fighter to explode after a delay of up to 60 minutes (time is set by the pilot). The explosive damage is contained within a 20 foot (6 m) area and inflicts 1D6x10 M.D. to everything within the radius of the explosion. All internal systems are obliterated. The escape pod will be automatically ejected prior to the explosion unless the pilot overrides the ejection sequence. TACTICAL LIFE SUPPORT SYSTEM: The XVF-1K cockpit is pressurized, and also provides additional air feeds to the pilot's flight suit that provides him with pressurized breathing. The REF flight suit also contains an upper and lower g-suit that promotes blood circulation even during high-g turns, thus decreasing the possibility of pilot's blacking out in combat.